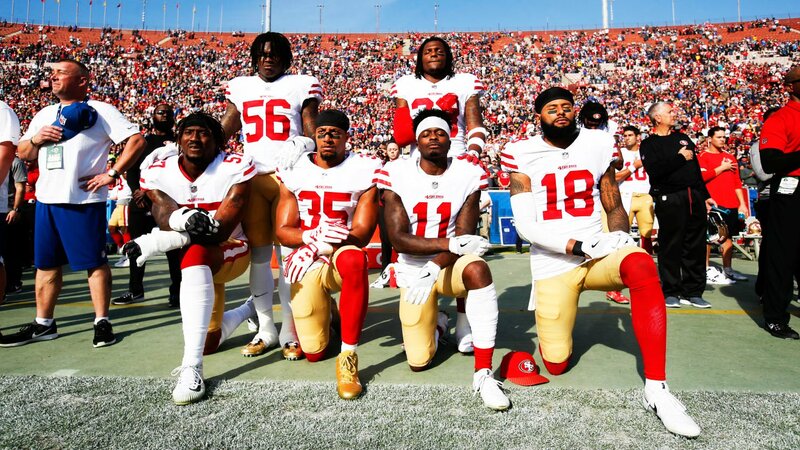 The owners of NFL teams have agreed on a new policy banning players from kneeling down when the national anthem is played, directly aiming at protests opposing police brutality and killings of unarmed African Americans, and impunity for these crimes that were the centre of national debate in 2016 and 2017 after former San Francisco 49ers quarterback Colin Kaepernick kicked off the peaceful protest. Many other NFL players, including those from San Francisco, Seattle, Green Bay and others, joined in protest at the start of last season, taking a knee or sitting during the anthem. Following his actions in 2016 many college students, high school and little league teams, women’s soccer players and others, also joined in refusing to stand for the anthem. While those joining in protest had various reasons for doing so, what was common in the collective action is use of the anthem as their symbol, which focused blame not on individual police, but on the U.S. state. “This season, all league and team personnel shall stand and show respect for the flag and the anthem,” said NFL’s chief commissioner Roger S. Goodell. “Personnel who choose not to stand for the anthem may stay in the locker room until after the anthem has been performed.” Owners decided to fine teams whose players violated the new policy, forcing protesting players to stay in the locker rooms if they don’t want to face reprisals. The measure was proposed, voted and adopted without consulting the NFL’s Players Association (NFLPA), which issued a statement in response, saying that players have showed their patriotism through social activism, community service and protest to raise awareness about the issues they care about. “The vote by the NFL club CEOs today contradicts the statements made to our player leadership by Commissioner Roger Goodell and the Chairman of the NFL’s Management Council John Mara about the principles, values and patriotism of our League,” says the NFLPA’s press release. The new anthem policy requires all teams and league personnel on the field to “stand and show respect for the flag and the Anthem.” Before, every player had to be on the field during the anthem, but now they are allowed to stay in the locker room or a similar location. This ritual was only introduced in 2009 as part of the “war on terror” and the promotion using professional and college sports by the Pentagon of national chauvinism. The latest action by the NFL owners comes almost two years after Mr Kaepernick, former San Francisco 49ers quarterback, protested racial inequality, injustice and police brutality across the United States by kneeling during the pre-game segments – when the national anthem is played – of the 2016 season in the league. He hasn’t been able to sign a contract with any team since then. Mr Kaepernick is good enough to play in the N.F.L., as Kyle Wagner of FiveThirtyEight has explained. The fact that teams won’t sign him looks like a clear-cut case of collusion and punishment for his stand. Mr Kaepernick has launched a class-action law suit against the NFL in this regard. The act of kneeling angered U.S. President Donald Trump, who urged team owners to fire all players who participate in the peaceful protests. Vice-president Pence walked out of a San Francisco football game in a widely-publicized photo op when the players knelt, knowing that this would happen. Some claimed Mr Kaepernick’s actions were disrespectful to the U.S. flag and to members of the armed forces. Such claims with rejected by Kaepernick and other players who joined his protest who said their actions were about the social problems in the country and had nothing to do with the military or the flag in-itself. African-American males are only 6 per cent of the United States population, but comprise nearly 70 per cent of NFL players. In Canada, CBC is disingenuously framing the issue as part of a U.S. “cultural war.” It does not seem to wish to discuss that, in general, Trump has been expressing the political demand of the U.S. state that it will decide who is and is not loyal, or a threat, and will act to use punishment and force with impunity and that the NFL cartel is an instrument of that demand. The broadening of the protest to include many other athletes and millions who expressed their support in various ways, was a further indication that the people do not accept impunity and inequality and more generally are rejecting the direction the United States is headed in. The crisis of the U.S. state is such that even the appearance of a government of laws has been abandoned as a government of police powers is consolidated. It is a government without regard for rule of law or legitimacy, but rather one of arbitrary actions and violence, at home and abroad. Now they are evidently so insecure about their own patriotism that they have felt the need to bully their employees into a ritual sign of respect. It is a classic form of punching down and strives to ensure that criticism of the U.S. state will be limited to clichés and platitudes. It contributes to acrimony against athletes and people of African-American origin. And it relies on disinformation that registers opposition as subversion. For those who profess an interest in justice, there’s nothing helpful about it. The American state carrying out violence with impunity is its only beneficiary. The demonstrations prompted the NFL to commit US$90m to social justice causes, in a tactic to stop the players from kneeling after the protests began to take precedence over the actual games. Mr Kaepernick had already announced he was denoting his entire salary as well as royalties from jersey sales to social justice causes. Black issues have never been a concern for NFL officials when it came to causes worthy of their monetary support. Instead, many NFL officials have donated millions to causes that were openly hostile to the Black Lives Matter movement — such as the Trump campaign. Originally, several owners, many of whom supported Trump — and seven of whom had donated at least $1 million to him — released statements denouncing Trump’s comments. “Yet none have used their economic power to actually address the problem that brought the protest on in the first place,” wrote Jessicah Pierre, OtherWords.org. Clear note should be taken that while sanctions against athletes who take a stand are presented in an acceptable light, the same politics are being put in place in the form that all agencies of the state, not just “security” forces, can act with impunity. It shows that while preparations are made to unleash imperialist war abroad, all measures are also being put in place in the society to unleash fascism at home so that the people are not able to mount an effective opposition. It must not pass. Every effort must be made to oppose the criminalization of dissent and make it very clear that it is unacceptable under any conditions and circumstances with no exceptions. It is untenable to accept a definition of rule of law which is in contempt of the very notion of rule of law. This is the field in which the greatest wrecking activity is taking place. The fact that all of it is done in the name of “rights,” “peace,” “democracy,” “security” and even “nation-building” shows just how subversive it is. 1 See “Kaepernick’s ex-teammate Eric Reid files collusion grievance against NFL cartel.” Danny Heifetz of The Ringer profiles Mr Reid here, and Mr Reid’s New Tork Times op-ed is here. 3. See Tony Seed, “NFL: A sports cartel without balls or integrity,” February 1, 2015 and Sally Jenkins, “Impunity of the NFL,” Washington Post, May 10, 2017. Amongst several articles on the role of the NFL in the militarization of sport published on this website, see “Systematic militarization by US sports monopolies and Pentagon,” November 17, 2015. All team and league personnel on the field shall stand and show respect for the flag and the Anthem. The Game Operations Manual will be revised to remove the requirement that all players be on the field for the Anthem. Personnel who choose not to stand for the Anthem may stay in the locker room or in a similar location off the field until after the Anthem has been performed. A club will be fined by the League if its personnel are on the field and do not stand and show respect for the flag and the Anthem. Each club may develop its own work rules, consistent with the above principles, regarding its personnel who do not stand and show respect for the flag and the Anthem. The Commissioner will impose appropriate discipline on league personnel who do not stand and show respect for the flag and the Anthem.